October is here! I love October because it means that MAYBE cool weather is on its way to Houston. Probably not, but a girl can dream, right? October also means it’s costume time! Last year, I composed two sweet costumes for my boys’ book character parade (see here) at school. Combine cool weather and costumes and you get…animal hat! 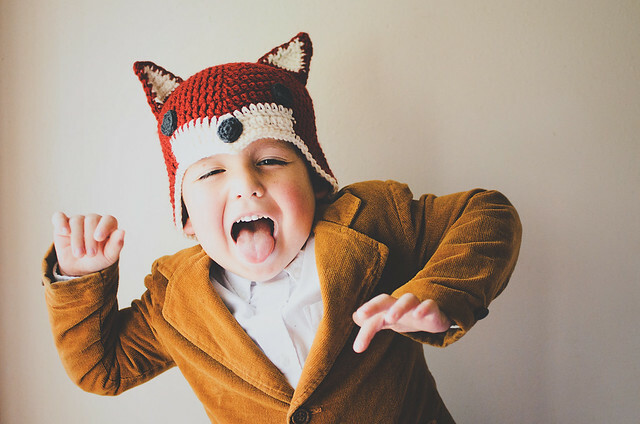 Specifically, a sly little fox hat. It features some interesting shaping to create the point at the front and long sides to cover the ears. It is definitely inspired by Ganomy, which, if you’ve been reading long, is my favorite knit hat pattern. This crochet hat is worked from the top down, though, and, like I said, has a point at the front. Instead of two sets of increases and decreases, there eventually are three. I hope you guys like it! I’ll put some notes at the END with suggestions for changing the size. Please read through before asking questions! Have fun! About 3.5 DC and 1.5 rounds per inch with larger hook. Each beginning ch-3 counts as 1 stitch. Round 12-13: Repeat Round 9, but switch to white after the third decrease and work with that yarn, carrying the MC, to the stitch before the next decrease. You will have to attach the new color every round. Finish the round in the main color, attach white at the end. Round 14: SC around in white, making [1 SC, ch 2, 1 SC] in the center DC of the increases of the previous round, slst to first SC. Fasten off. Weave in ends. Note: the ears are made up of two pieces each– a solid piece in the MC of the hat and a piece that is white + the MC. Ch 1, SC 9 down the side of the triangle. At bottom corner, ch 3, then turn triangle clockwise to work across the beginning chain, SC 9 to next corner, Ch 3, then SC 9 back to top of the triangle. SC in the sc2tog stitch from last row, ch 3, SC in same st, slst to first of the SC you made down the side of the triangle. Fasten off. Make 2 pieces for the front of the ears. Work pattern as above, but switch to white for Rows 2-9. Switch back to main color after last SC2tog and work border in MC. Leave a long tail at the end of these pieces. Stitch a front and back together, then sew in place on your hat. With smaller hook, make 6 SC into a magic loop. Cinch loop shut. Slst to first SC. Sew eyes and nose in place with tail yarn. As-is, the pattern fits a child size heads. My son is 5, but his head is about the same size as his 8 year old brother. For a larger hat, I increased my hook to a 5.5 mm (US I) and added some more repeats of Round 9 before making the last 3 rounds. It would be possible to make some more complicated increases, but I can’t give any specific advice on that. Try working the pattern through once, so you can see where the increases are placed and then work it again, adding an increase round after Round 4 (increase to 60) and then some round(s) after 8 (remember–Rounds 5-8 are increasing stitch count by 6 DC each round). The last 5 rounds are the same, so you would just need to figure out where to put the decreases that balance out the increases. Good luck! Thank you so much for this pattern! I love it! It is so simple and easy to follow along! :) just got done making one for my baby boy, for this winter! Did you reduce the pattern to make it for a baby? Is it possible for you to show your reductions? 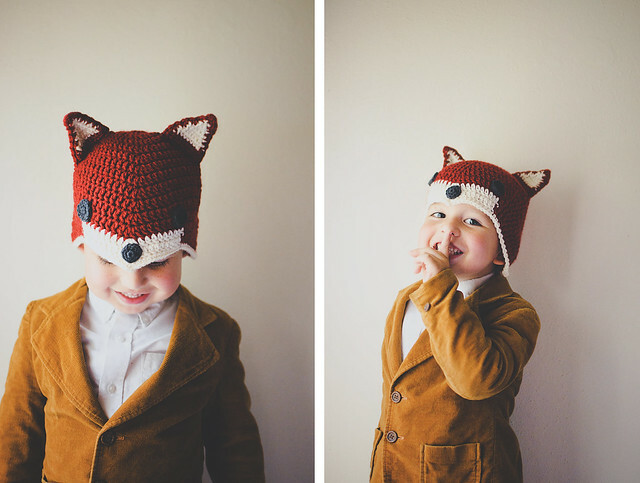 I really want to make this for a December baby whose last name is Fox. 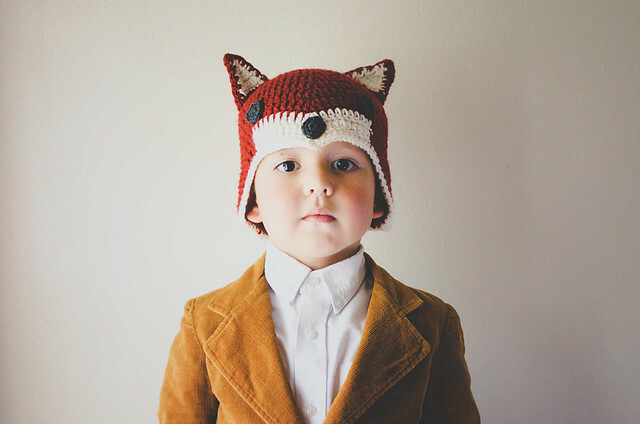 Hi, the sly fox hat looks great, could you adjust for adult size please. Even without the coloring and ears the shape would be excellent, covering the ears nicely. Love it! To add the finishing touch to this tree, consider adding a train see that goes around the tree. These stories have contemporary settings and story twists which are stimulating and enjoyable. Consider selling in lots if you accumulate too many to list individually. Amazing ! I’ve been looking for this pattern for such a long time… Unable to invent it but your instructions were super easy to follow. Thank you so much ! Thanks for sharing this pattern! The pattern was clear and easy to follow and the hat worked up quickly. It was a fun weekend project, thank you again. Cheers! My granddaughter loved this hat. She’s in college and their “mascot” is a fox. I’m using a “J” hook, and so far so good. I did add additional row 9. Only question I have is the joint rows the back of the hat? Finished the hat! Overall, pleased with it. Took longer to do ears than main hat. After I sewed the ears on, wasn’t quite right to me, but had stitches hid so well, couldn’t redo. I’d post photo, but not sure how to do it here. Just got a selfie from granddaughter, fits pretty good. Thanks a million for the pattern! With large hook, Ch 3, 11 DC into a magic circle. Hi. I am a beginner and do not understand this bit about magic circle. Could you please explain? Thank you. I do it slightly different, but the point is to be able to pull the ring completely closed, especially important when making amigurumi. You do not want the stuffing to come out. Then I found this, which is a different way to do it but quite clever. I will try it someday. I have made a couple of these in the child size but would like to know if anyone has done a 9 to 12 month baby size? If so could you please post what you did? Thanks! It’s an adorable pattern! 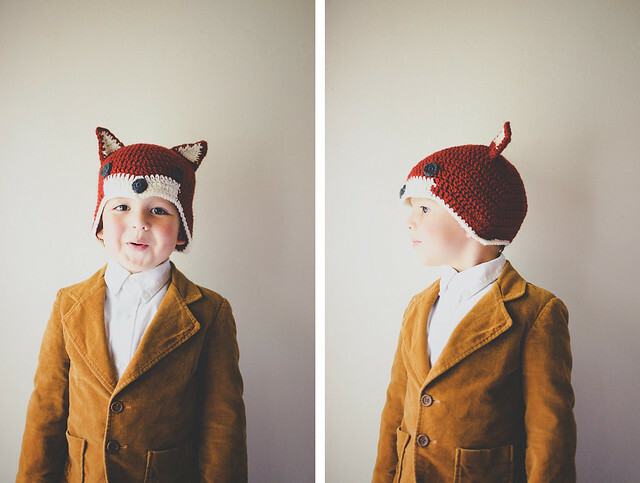 Hi there… love this hat and will be making it for 2016 Christmas gifts for loads of kids. Can anyone tell me how many kids hats you get with one skein of Vanna’s Choice? I need to order yarn and would rather do one order. Thanks for any help and thanks a ton for such a cute hat pattern. 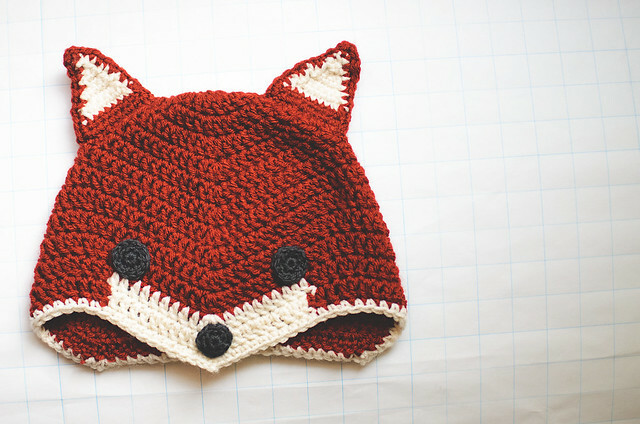 Very cute foxy hat! Would it be okay to sell the finished item to raise money for a scholarship? Thank you for the pattern it came out great!. I made it exactly as the pattern but used a 3mm hook which is between US C and D hooks. Approx 5 stitches per inch. This gave me a 16 inch around the bottom hat and measured 5.5 ins from crown to nose tip. This should be approx a 12 month size. I used buttons for the nose and eyes as I did not have a smaller hook. I made a perfect adult hat, I inserted 2 more repeats of row 9 and used a J hook. This produced a gauge of 2 rows per inch, and 3.5 dc per in., which is a perfect fit for my 22″ circumference head. I bet that if you needed to make a large man’s hat, you could do the same with a K hook. I’ll report how that works out, as I have a few sly old foxes on my Christmas list to make these for! I just made a perfect adult hat. I inserted 2 repeats of row 9, and used a J hook . This produced a gauge of 2 rows per inch, and 3.5 dc per in., which is a perfect fit for my 22″ circumference head. Fits like a glove. I think that if you needed to make a large man’s hat, you could do the same with a K hook. I have a few sly old foxes to make these for, so I’ll let you know how it works out! Wondering if you made the larger hat with the K hook and how it turned out? I’ve made this hat twice and both times, it’s been super small. It might fit a 1 year old. It’s only a 17″ circumference. Has anyone else had this issue? Would like measurements for a 9 month old baby please. Round 9 is not working out for me. Anyone else having this problem. I’m not sure what I am doing wrong. I am following the instructions and end up having eight double crochets at the end. If I sleep stitch to the beginning it leaves a big hole. What am I doing wrong? I’m also having problem with the round 9. It doesn’t end up with 72 stitches. Don’t know what I’m doing wrong. Round 8 fineshes with 72, and round 9 fineshes with 84. Cute well written pattern, love it, it would be great for a Birthday or Christmas gift. I’m not sure which I like more…. that kid is a natural! He’s so adorable and he’s got such flare. Thank you very much for sharing the pattern. Is there a chance that you a tutorial video as well? Is there a chance that you have a tutorial video as well? I just saw this hat in a Deutsch serie, Dark (2017), I googled fox hat and found your pattern! Thanks! Hoping I can get an answer soon as I would really like to make this hat this week. I am wanting to know if the slst in each row is the back of the hat. I am wanting to slightly modify the pattern to add a hole for my ponytail (so it will kinda look like the foxes tail) and need to make sure I am adding it to the back of the hat. I don’t understand where these “decreases” are? We have a total of 26 stitches, repeated 26+26=56 within the bracket. Total of 14 after bracket. OMG. I’m an idiot! This is my first time trying to follow a written pattern instead of following along with a video. I figured out what I was doing wrong with the decreasing. Now I got it! I’m no longer having problem with round 9. I was confused about the DC2tog, I was crocheting 2 double crochet in the same stitch instead of crocheting 2 double crochet in the following 2 stitches looping in one stitch, creating the dicrease. Now it’s 72 stitches in the end!